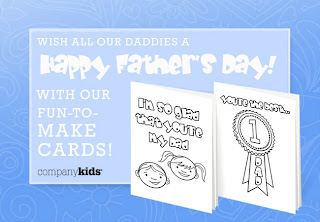 If you haven't already lined up a kid-produced masterpiece for next weekend, Company Kids is offering free downloadable Father's Day cards on their Facebook page. They're blank so your kiddos can customize them to their hearts' content. I recommend plenty of glitter and glue, perhaps a finger-painted portrait or a handprint. By the way, you might also want to check out Company Kids' Clearance Sale for great bargains on clothing, furniture and bedding- all made from the high quality natural fibers that are a Company Store tradition. My current wish list: the jersey/tulle ruffle skirt and fair isle knit sidecar boots for Roo and the military-ish terry knit jacket and long sleeved tie tee for Jasper. There are some amazing deals on holiday finery and winter gear, too, if you are good at planning ahead. In accordance to the FTC Guidelines and WOMMA Code of Ethics, I am disclosing that I have received complimentary merchandise in the past from Company Kids but chose to share this information with you on my own volition because I like their stuff!